Now that Fizzy has been on Farrier’s Formula for one month, and we have been using Keratex Hoof Hardner for one month, we needed to do a check in on the quality if his hooves. We can definitely see small improvements since shoeing, and HUGE improvements since before he was shod. I wish I had pictures from each angle immediately after he was shod to compare them to now, but I don’t we will have to do our best to judge. Overall, they are looking better. In the below pictures they were clean with Keratex applied, which explains the difference in color near the coronary band (dull) to the hoof wall (shiny-where Keratex has been applied). So please ignore that. 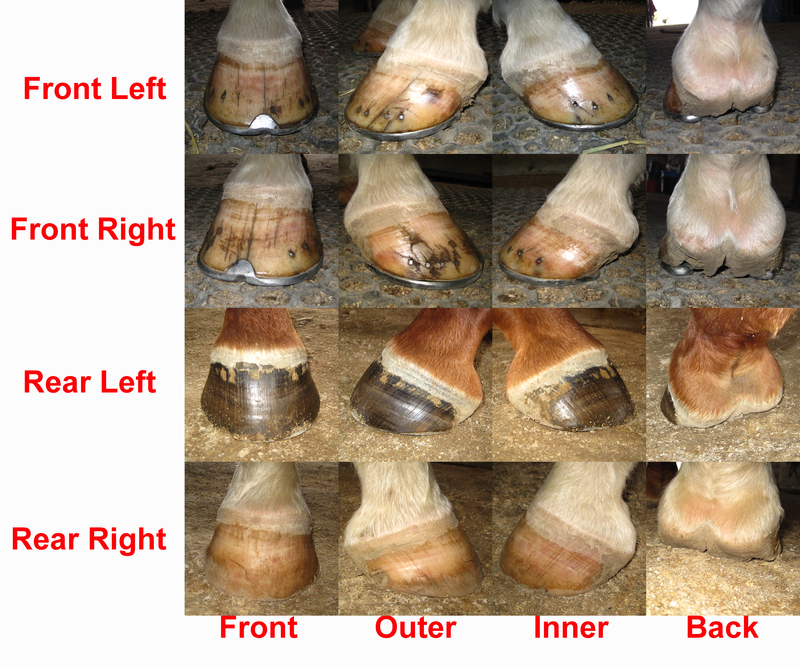 We are evaluating overall hoof quality since being barefoot, then shod (February 25th) to now. It’s almost time for a reset! Next month, I will take the same pictures as below, so we have a definite comparison rather than just a guessing comparison. However, I think it’s clear there has been growth and improvement. We are going to stay on course with the Farrier’s Formula and Keratex and keep our fingers crossed that the quality continues to improve! Afterall, no hooves, no horse, right?